The lesson for all of us here is never to volunteer to hold the oars, not even for a second. Splinters are the least of your worries when you’re facing very strong headwinds, and space junk up to wazoo. Don’t say you weren’t warned, friends and others. 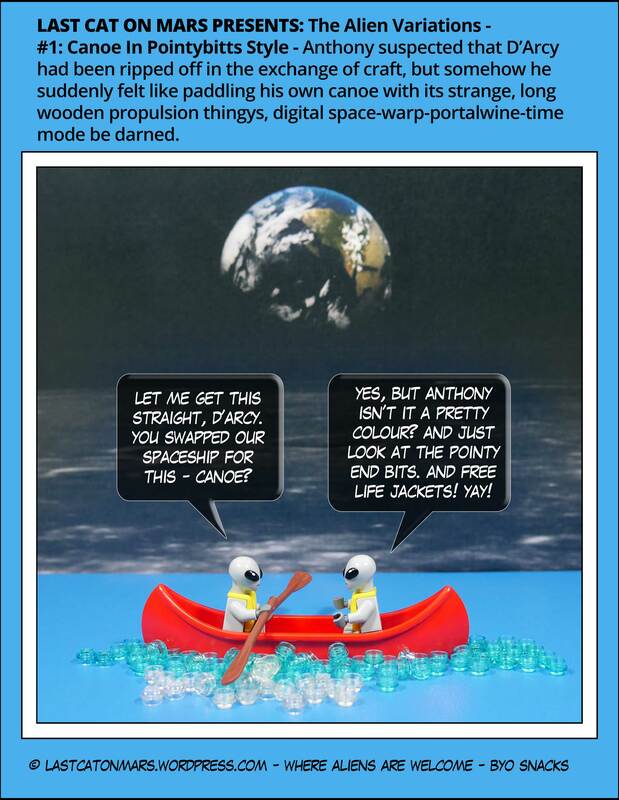 This entry was posted in Space and tagged alien variations, aliens, canoe, cartoon, comic, lego, minifigures, skateboard on January 18, 2017 by Jay Verney. It only remains for us to make a booking and turn up for Chef Francesca’s delicious tuna-themed slices. Well I remember a little pizza joint just around the corner from my alma mater, the august and september-y University of Queensland, in Hawken Drive. It was truly a dive, because you had to dive down below street level, with the aid of a set of stairs as I recall, or perhaps simply a well-timed roll, in order to enter its very Bohemian portal – well, it seemed extremely Bohemian to a little cat from Central Queensland’s sticks still trying to find her city paws. Great pizza though, and drinks. Oh, the drinks. One was far too many, friends, and, as usual, a hundred more were never quite enough. Good times … the little I well remember of them. 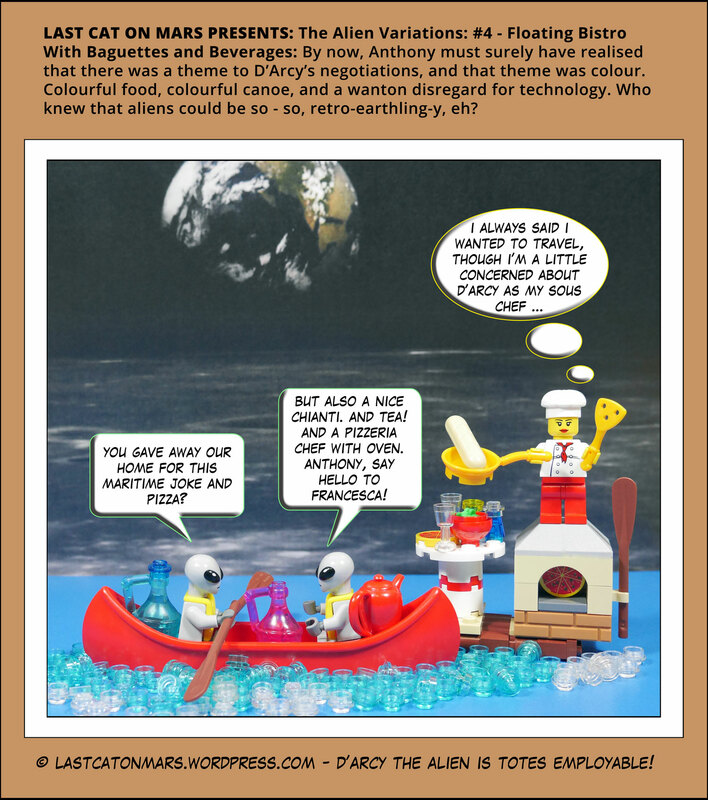 This entry was posted in Space and tagged alien variations, aliens, canoe, cartoon, chianti, comic, lego, minifigures, pizza, pizza chef, pizza oven, tea on January 4, 2017 by Jay Verney. Yes, the banana can travel anywhere at a moment’s notice, fully suited up, ready for anything from biting and nibbling to slicing and dicing to mashing and smashing. Never mind the avocado toast, friends, try some fork-squashed Lady Fingers on Sourdough, or even Happydough, with a soupcon of cinnamon sugar and a teeny, tiny squeeze of original lemon juice, just a few citrus-y drops. You will love it, it will love you. That’s all. 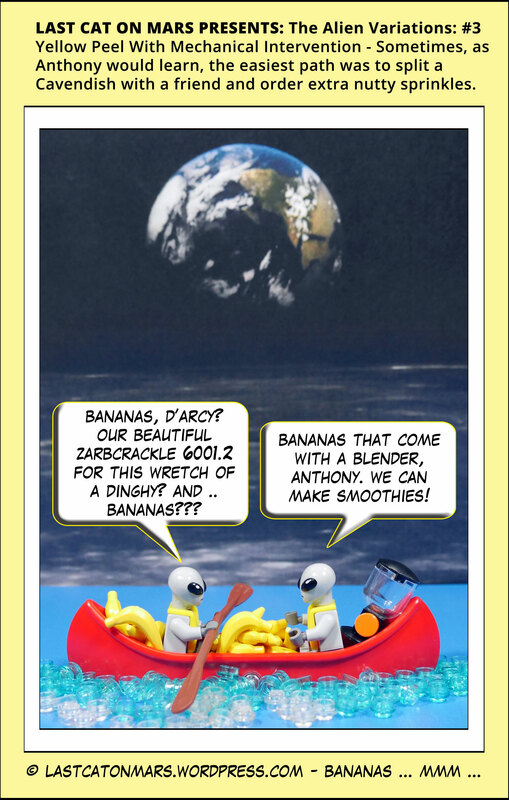 This entry was posted in Space and tagged alien variations, aliens, bananas, blender, canoe, cartoon, comic, lego, minifigures, space on December 14, 2016 by Jay Verney. They’re always on the lookout for new ventures, they just lack the capital to convert them to heavenly success. But don’t feel too sorry for them, fellow viewers; after all, they have a very red canoe, and the possibility of members of the largely adorable Leporidae family visiting sometime soon. D’Arcy and Anthony – gotta love ’em, or not – oh, why not, harmless they are, and as cute as the Leporidaes (yes, the furry, mammalian Leporidaes from Edam-on-Rye, or was it Bungles-Upon-Bungles)? Or, was it, Rabbitproof-Under-Fence? 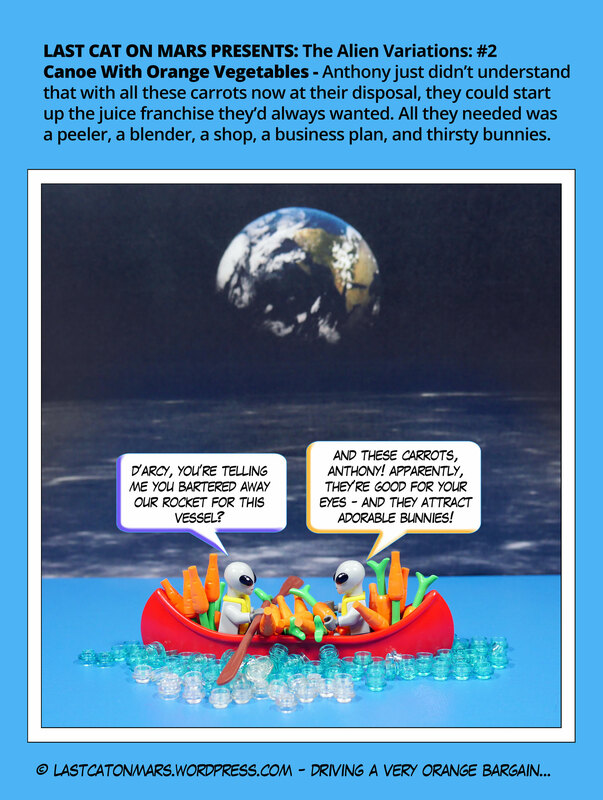 This entry was posted in Space and tagged alien variations, aliens, carrots, cartoon, comic, lego, minifigures on November 19, 2016 by Jay Verney. I don’t know D’Arcy or Anthony personally, but the fact that they exchanged their spaceship here on Mars with some rogueish southerner from the Medusae Fossae Formation seems to follow a family pattern. Two of my actual friends, Cy and Clark, have already committed to the Red Canoe Cult – you can check them out enjoying a little angling in the Hale crater. They bear a remarkable resemblance to these two soon-to-be fishin’ fools. 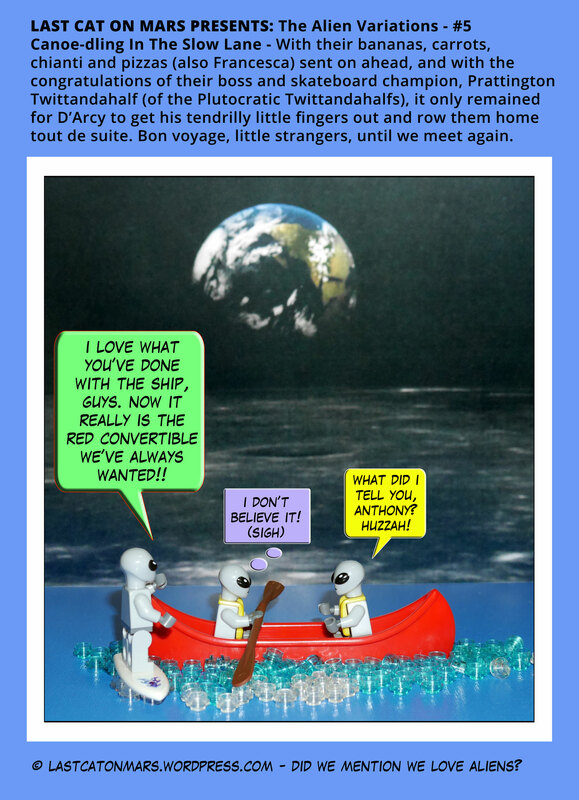 This entry was posted in Space and tagged alien variations, aliens, canoe, cartoon, comic, lego, minifigures, water on September 13, 2016 by Jay Verney.